You've probably built LEGO cars in your childhood, but none are as advanced as this one from a Romanian inventor. We've built simple stuff with LEGO. Airplanes. Ships. Cars. Guns. But nearly all of them probably won't qualify as art. There are, however, some really dedicated members in the LEGO community who put the hours into it, like a serious craft. These are some of those—products of a real love for the simple building block called LEGO. Twenty-one year-old Romanian inventor Raul Oaida used over 500,000 LEGO bricks to build this car with an engine powered by compressed air. 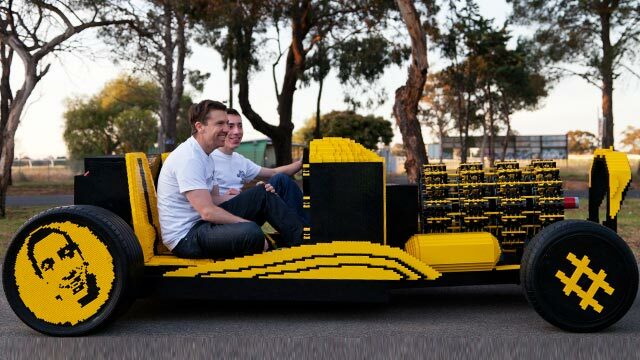 The project was completed in December 2013, racking up a bill of $60,000 for the LEGO bricks alone, and is able to reach speeds of up to 20 mph. Everything except for the wheels, tires and gauges are built from LEGO. No word yet on whether we could outfit the car with this LEGO V8 engine here. 2) The LEGO "Great Ball Contraption"
Japanese LEGO builder Akiyuki has a fascination for automatic machinery, and in 2012, constructed an incredible, complex-looking machine that looks like an assembly line in a factory. While it does nothing particularly useful, it's still cool to look at. Photography enthusiast, Carl-Frederic Salicath, built a working film camera in 2012, modeled after boxy cameras of the past. Here's one that you can actually build on your own, following his guide here. It even has a vintage-y name: The Legoflex B1! In 2011, inventor Arthur Sacek invented a 3D printer made entirely of LEGOs, save for the drill which carves out the 3D forms from floral foam. A design is run through the computer, which then sends out the direction to the printer. Pretty impressive how accurate the models appear afterwards!